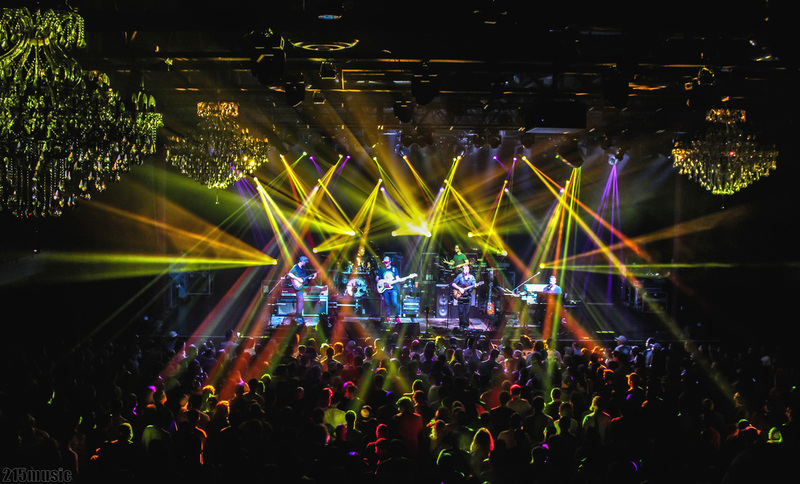 Umphrey’s McGee once again treated fans to an all-out musical onslaught on the second night of their three night stand at the Fillmore in Philadelphia, setting the stage for a big Saturday night finale. This show had it all folks – original material arrangements, covers, an acoustic segment and sit-in from Philadelphia native Marc Brownstein of the Disco Biscuits. The first set lead off with “Le Blitz”, which soon gave way to a “1348” segment which wove in and out of the original version of “Cut the Cable”. A silky “Wellwishers” would ensue, and by this time the venue floor was near capacity without ever feeling crowded. The crowd received their first clue about things to come during “Utopian Fir”, which included an “In Bloom” tease and filled the air with a palpable amount raw energy. After “Stinkos Ascension”, a new song for this budding fan, the band would shift gears as matching acoustic guitars were brought out for band mates Brendan Bayliss and Jake Cinninger. “Gone for Good” was dedicated to a long-time UM fan who passed away the night before, a beautiful tribute to celebrate her life through music. Staying on acoustic guitars to close the set, the tune “Great American” sandwiched “Dim Sum” before the band left for set break. The second set kicked off with the band staple “Nothing Too Fancy”, opening the doors to what would be an incredible set of improvisation and a non-stop dance-a-thon. Segues into “Push the Pig” and “JaJunk” ensued, followed by a guest appearance by Marc Brownstein. Brownie replaced bassist Ryan Stasik for an amazing 14-minute “In The Kitchen”, but Stasik and his light-up kicks would return to the stage for the Sturgill Simpson version of Nirvana’s “In Bloom”. A wonderful version of“August” followed, eventually leading us back to the song that started the set an hour earlier and completing the journey. A double encore of band-original “Attachments” and The Who’s “Join Together” capped off the show in rock star fashion, check out the videos of the two songs below. One more night of Umphrey’s awaits us tonight, and we hope to see you there! Get in the van, car or bus, and get down to the Fillmore tonight to catch Round 3 of this heavyweight event!